Profile Response: Dave Salmon, Pelican Bay Prison, Crescent City, CA | How Will We Live Tomorrow? Pelican Bay Prison’s massive white blocks cannot be disguised by the slender pines that surround it. It has no sign; it doesn’t need one. Any passerby understands that the State of California is locking up evildoers in this remote corner. Everyone nudges the accelerator pedal and moves on. Dave Salmon, the sole social worker for 2500 inmates, explained that the high security facility was built in the 1980’s as a response to gang infiltration of the prison system. 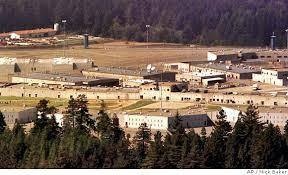 It was located here, remote from cities and gang influence, and designed to minimize prisoner interaction. Most of the facility is divided into secure housing units (SHU). Prisoners spend 22 hours a day in solitude and have 90 minutes of exercise. “The prisoners filed a lawsuit that the organization of Pelican Bay itself constitutes cruel and unusual punishment.” A settlement was reached the week before I spoke with Dave. As a result, some things at Pelican Bay will change. “Now, men are assigned to Pelican Bay based on gang affiliation. That’s no longer a justifiable reason. 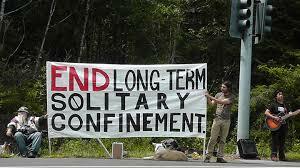 Prisoners can only be in long term solitary based on behavior.” There will also be increased exercise and social time. In theory, men are transferred from SHU to a recovery hub for three to five years before release, to provide more interaction and better opportunities to get a GED or job training. Despite these efforts to prepare men to reenter the world; almost two-thirds of California inmates return to prison within three years of discharge. This entry was posted in Responses and tagged California Proposition 47, parole, Pelican Bay Prison, SHU, solitary confinement. Bookmark the permalink. To quote the California State Prison System website: “Keeping strong family connections with loved ones is a powerful rehabilitation tool.” Pelican Bay Prison is 370 miles north of Sacramento. ..and it’s over 700 miles from San Diego. There is nothing rehabiliatory about Pelican Bay Prison. It’s just punitive.